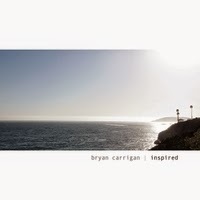 Solo artist Bryan Carrigan’s fifth album Inspired more than lives up to its name. I can tell you right from the start that I think we have a new age masterpiece to consider in 2014. Bryan Carrigan is a producer, engineer, music editor, synth programmer, scoring sound designer, remixer and composer of electronic music. His career has spanned the gamut of genres working within the record, TV and film industries lending his skills to hundreds of projects. Bryan has also released 5 albums of his own blend of electronic, ambient, downtempo, chill out and new age music - Passing Lightsand Focus in 2011, Windows in 2012, Below Zero in 2013 andInspired in 2014. Carrigan is obviously a multi-talented individual that understands what his abilities are and works within that scope and range to create his music. Knowing what your limitations are is an important factor in the creative process and it became readily obvious to me in short order that this man has everything under control. As the first track “Elation” begins, it makes you feel like you are standing at the highest peak of a mountain range watching the sun rise then suddenly flying through the billowing clouds above. The feeling is one of Elation! So mission accomplished. The album has a nice flow and it takes you “Along The Path.” And that path is your choice as you let the music take you there. As the CD suggest on the back cover “Finding inspiration in everyday life is within reach. Find your happy.” Well this music fan found a happy place listening to Inspired. “Kaleidoscope” is self-explanatory. The music has many colors and hues. I could appreciate the way Carrigan used all the various keyboards to blend it into a living breathing piece of music. The quality of this music is evident in every track. What I found most appealing is how it had the ability to give me a sense of hope and excitement but in the same instance gave me a relaxing peace inside. The kind you find when you look at your soul mate and know it is your life’s path, or when you look into your dog’s eyes and know without a doubt that there is a caring loving soul behind that gaze. It’s the warm and fuzzy stuff but it is very spiritual in nature. The music initiates all of these feelings and keeps you there. “Warm Embrace” is just that. The opening sequence is gentle and inviting with strings gently plucked leading the way then keys laying down a bed of rose petals for you to walk over in your mind’s eye. The pace is just right on this track it delivers complete bliss to your mind, body and soul, the sacred triangle of life. New age instrumental music never requires any lyrics to create an atmosphere to generate good feelings and a sense of being one with everything around you. Bryan Carrigan is masterful in taking a blank canvas and creating a masterstroke of musical beauty and pleasure. This recording has so much to offer within the 12 tracks. I completely enjoyed the entire set. If you are into new age music or instrumental tracks you will be Inspired to hear this recording any time day or night. This is one of the best natural fixes anyone can have.